A big thanks to Scholastic for sending me an advanced copy of Lisa Ann Sandell's A Map of the Known World. Ever since I read and loved Sandell's Song of the Sparrow, I have been eager to see what she would write next. I knew it would probably be something quite different. It both was and it wasn't. 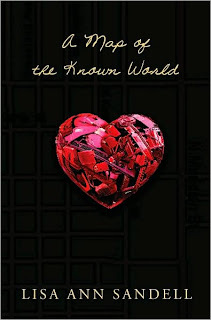 Where Song of the Sparrow was an Arthurian novel in verse told from the perspective of Elaine of Ascolat, A Map of the Known World is a contemporary prose novel about a girl named Cora's struggle in the wake of her brother's death. What they share is a young woman's attempt to make sense of (and leave her mark on) the changing world around her. Cora's brother Nate died in a car crash six months ago. And Cora's been on her own ever since. Grief inhabits all corners of her world now. Her parents effectively collapsed in on themselves after Nate's death, her best friend doesn't know how to talk to her anymore, and Cora is afraid she will forever be known as the little sister of that boy who died. As she prepares to start high school, Cora desperately hopes the horrible stasis she's been existing in will somehow change. Any change will do, really. But one for the better would be nice. Change comes in the form of Damian Archer--her brother's best friend, the boy who was in the car with Nate when it crashed, and the one person everyone blames for Nate's untimely death. Damian gifts Cora with a wealth of unknown details about her brother and unwittingly gives her the key to changing her life. This is a story about grief, art, family, and first love. It is a story filled with sadness and Sandell balances this by weaving in those moments of breathless understanding and discovery that only come when one is fifteen. I liked Cora. I found her incredibly strong for being able to withstand her parents' suffocating despair, her friend's gradual defection, and the painful realization that she didn't really know her brother at all. Sandell's storytelling is meticulous and genuine. And it was so refreshing to read about an adolescent girl who seems utterly normal, yet so intent on seeing her world clearly. Cora is definitely fifteen and impressionable. She thinks and talks like a fifteen-year-old, squeeing and ranting at all the appropriate times. Yet she is not content with mundanity. She strives for something more. It was a pleasure to spend time with her (and Damian) and, once again, I look forward to reading whatever Ms. Sandell writes next. Thanks so much for this review, Angie. I've seen this book cover here and there, but never took the moment to find out more about it. After reading your review, I'm compelled to seek this one out. I admit that I tend to shy away from stories that sound too depressing, but I don't know... this one sounds worth the battering of my emotions. Plus, I think my teen would really like this one, too. Christine, anytime! And I think it would be one you and your teen could enjoy and talk about after.